Earn up to 888 reward points. A versatile acoustic guitar electonics system with more headroom and transparent sound. 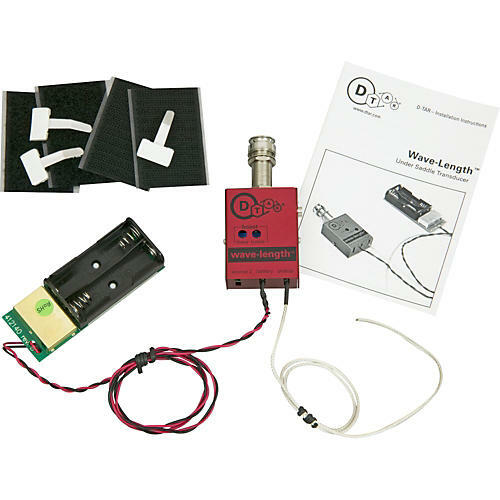 The D-TAR Wave-Length combines a thin, piezo under-saddle transducer with an 18v, low-noise, high input impedance preamp, to create a pickup system with twice the dynamic range of typical 9v systems. The 18v preamp is powered by two AA batteries. With 18 volts, your signal has more headroom, so hard strumming won't distort as easily. The Wave-Length preamp also has an input for a second source, like a magnetic pickup or a soundboard transducer. Two adjustable trim pots, one low frequency shelving and one high frequency shelving, allow you to fine tune and set and forget the bass and treble frequencies to optimize the Wave-Length pickup and preamp for your instrument's size and shape; enabling you to transparently amplify the natural timbre of your acoustic guitar with minimal coloration. D-TAR includes a 1/4 " jack (jack 6,35) and detailed installation instructions with the Wave-Length undersaddle pickup and preamp. Seymour Duncan and Rick Turner are two legends who spent years working with musicians, perfecting their tone. Seymour founded his self-named company in 1978 which has become well-known for its wide variety of guitar and bass pickups used by just about every name player from Billie Joe Armstrong to Angus Young. Rick co-founded Alembic, was president of Gibson Labs West Coast R&D Division, co-founded Highlander Musical Audio making piezo acoustic guitar pickups for Lindsay Buckingham, Ry Cooder, David Lindley, and Andy Summers, and runs his own Renaissance Guitars. Now Seymour and Rick are working together to create innovative products for acoustic musicians. Their D-TAR motto: "With respect to acoustic tone." Thin cable design easy installs in guitars with either 1/8" or 3/32" saddles, often with no modification to the saddle slot. High Headroom allows for twice the dynamic range of a 9-volt system.